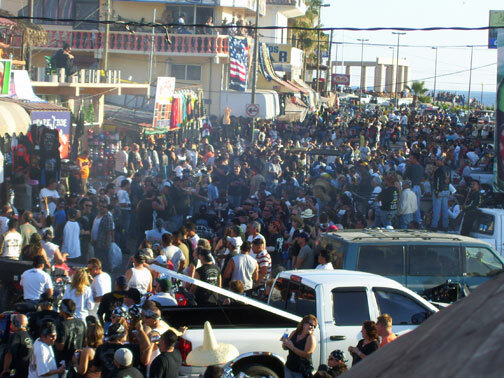 No visa is required to visit Rocky Point at this time. But, all border travelers are required to present a passport sometime in 2009 or later. Currently, a driver's license or government issued ID AND another proof of citizenship (such as a birth certificate) is required to re-enter the United States. The Northern part of Sonora, Mexico, especially Puerto Penañaco (Rocky Point) is considered to be part of the "Free Zone." This area does not currently require a passport visa. International students can only re-enter the U.S. through Douglas or Nogales and must have valid documents for reentry. There is virtually no wait, or very little, to enter Mexico from the Gringo Pass International border station in Lukeville to Sonoyta for the 1-12/ hour drive to Rocky Point. The return trip into the U.S. can take from 20 minutes to an hour or more depending on the day, weekend, or holiday. The port has three passenger lanes and one commercial lane. Up to 5,000 vehicles a day may pass through on the holidays. An average 830 vehciles pass through on a typical day. Peak travel days, typically occur between noon and 7 p.m. on Sundays and Mondays. From Arizona: Cross the border at Lukeville, U.S./Sonoyta, Mexico international border. Puerto Penasco is 63 miles south on Mexico Hwy. 8. The border is closed from midnight until 6am. There are also several shuttle companies between Phoenix/Tucson and Puerto Penasco . From California: Take US Hwy. 8 east from San Diego or US Hwy. 10 east from Los Angeles area. Either drive through to AZ Hwy. 85 (Gila Bend, Arizona) and head south to the Lukeville/Sonoyta border or cross the border at either Algodones (across from California) or San Luis Rio Colorado (across from Arizona, south of Yuma, AZ.). Immigration requirements to enter the U.S.
Do not carry a lot of cash when you go into town or on the road. It's not that the local residents are to be feared anymore than in any other city. Reports about unscrupulous Mexican police who shakedown touristas on the road still exists. The desolate roads between cities are especially notorious. If you don't speak Spanish, and want to avoid contact with the local officers, drive slow (try to be sandwiched between other vehicles). Keep your extra cash stashed in your vehicle- not on your body. You may be asked to go to the police station. Just expect that your fine will probably be whatever you empty from your pockets. Note that there are no speed limit signs on most of the roads. If you feel you have been harrassed by the policia or federales, get their name ("nombre") and badge number ("numeral") and report them to the U.S. Consulate. Mexico can't afford to retain that outlaw policia image. Keep your identification with you at all times. As of 2008, U.S. citizens may be required to have a U.S. passport to re-enter the United States. U.S. cell phone services may not work in Mexico. Roaming charges and extended charges may apply if you do have cell service. Check with your cell phone provider for coverage in Puerto Peñasco, especially road coverage for the drive through Mexico. Phone calls can be made through the resort's phone systems, but international and hotel charges will apply. Drinking Water: Rocky Point restaurants and resorts use purified bottled water for drinks, ice cubes and cooking. Many of the resorts and hotels provide bottled water to guests- be sure to ask beforehand. After you make your reservations online, call the 1-800 numbers of the hotel to inquire about bottled watter (Is there a charge? How many provided?). If they don't provide enough, bring water with you. Be sure to hydrate with plenty of water of you are drinking plenty of beer and alcohol. Alcohol: Purchasing alcohol before you enter Mexico is cheaper than paying $2.50 for a Corona, Tecate or Modelo if you want to drink in your rooms. Although there is a Circle K nearby (not walking distance), it's cheaper to stock up in the U.S. Excessive consumption can be dangerous. Mexican police do arrest people who are drunk and disorderly. Anyone 16 years of age or older is tried as an adult. The Duty Free store at the Lukeville port (to the right of the international crossing) will save 20-30% or more from taxes. The only drawback- you can only bring back up to 1 litre of alcohol per person per 31 days. Most people stock up on the way down (no limit) and finish their load in Rocky Point. After crossing the U.S. border, park at the Duty Free Shop lot. Make your 1 litre purcahse. Take the pedestrian crossing into Mexico. Walk across the street to the U.S. pedestrian entry. Show your ID and declaire your booze. Get back in your car and head home. Meds: Bring medications in the original prescription bottle and the original prescription, if available. Carry emergency contact information in your wallet (or inside your shoes). If you are injured, this will be the best way to help you. © 2007-2008 EMOL.org / Entertainment Magazine On Line / AZentertain. All rights reserved.